Personalized Travel Portfolios, Custom Printed in Bulk. Zippered, Promotional, Inexpensive. Budget Prices in America. Bulk Discount Travel Portfolios on sale. We also supply blank (not imprinted) wholesale Travel Portfolio for $11.99 each (minimum quantity: 20). 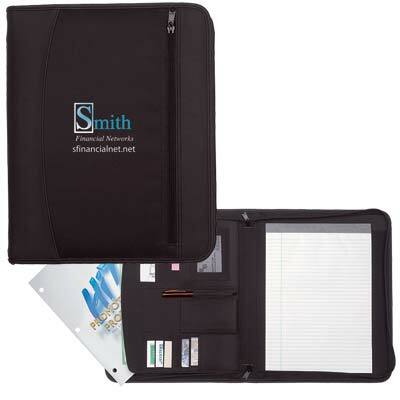 Lowest cost in USA and Canada for wholesale promotional Travel Portfolios. American clients pay no taxes. The unit prices below include your 1-color custom imprint on one side. We also supply blank (not imprinted) wholesale Travel Portfolio for $11.99 each (minimum quantity: 20). Setup Charge: $40.00 per color; Re-order Setup Charge: $25.00. PRODUCTION TIME: 3-5 days after art approval; blank travel portfolios ship next day. Imprint Method: Silk-Screen or Transfer. Packaging: Individual Poly Bag, 15 per carton @ 23 lbs.